When I was younger, I dreamt of being a professional rugby player, but in the back of my mind I thought 'scrap it'. As a female, you get to a certain age and assume it will not be possible, as there are not many opportunities. 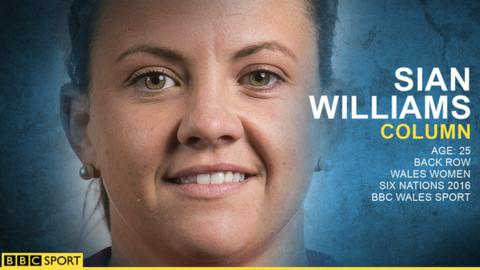 So it is a dream come true to be Wales' first female rugby player with elite athlete status and the Royal Air Force's first full-time female athlete. To start with I will be flying solo but hopefully this is just the start and more women will become full-time too. Personally, I would not be where I am today without the RAF's support. They have released me for at least two years to be able to train full-time with Wales. I have been in the RAF for seven and a half years and I have always played RAF rugby as well as being in the Welsh setup. I have juggled work and rugby at the same time. I lived in Oxford and travelled to Cardiff three times a week to train with Wales, and trained at Worcester for my club twice a week. I would spend around 12 hours a week in the car, travelling back and forth, so it was difficult to get a good balance between work and rugby. That will not happen anymore - that time can now be spent training. That is why, when wing commander Jackson, the chairman of women's RAF rugby, told me there was a possibility I could go full-time, it was an opportunity I could not miss at all. I chose to join the RAF because I am not very academic and I did not want to go into higher education. I wanted to do a job that was exciting and has got that physical aspect, to help me play my sport. It is a male-dominated trade and the boys do not hold back. They really get stuck in with the banter. The boys are a lot more lethal with the banter than the girls in the dressing room, because they do not hold back. But all the boys haven been really supportive of me. Now I will be posted to RAF St Athan, near Cardiff, using the centre of excellence daily. We have a full-time conditioner, full-time physio, plus Rhys Edwards our head coach with Wales, and I will not have to juggle work with training. The biggest benefits are going to be in recovery, getting some rest after matches, and getting my sleep back to normal rather than working nights with the RAF. I cannot have excuses now, for not being the best I can possibly be. People are going to look at me and say 'you're full-time', so there is a little bit of pressure, but I like pressure. It is really exciting and I have got to make sure I push myself forward and make the most of the opportunity. The RAF sets you up mentally for any challenge that comes at you. It is not enough to be robust and strong - you have to become mentally tough. I hope that training helps me on the field, especially in the current Six Nations campaign after our disappointing loss to Ireland in our opening game. Scotland are going to come at us all guns blazing on Sunday. It is going to be a battle and we will need to weather the storm. Patience will be key and then we need to take every opportunity we create, to get points on the board. It is a must-win game for us after losing 21-3 to Ireland. Last Saturday, we definitely did not perform in parts. Ireland had really done their homework and they completely shut us down. There are positives to take defensively and our defensive lineout was really strong but it is really disappointing. But it is good that we have had this blip now, rather than a few games in, because we can learn all our lessons early. Sian Williams was talking to BBC Wales Sport's Tom Garry.